Dan Wright first became well known and highly respected for his modifications of other companies' digital components, hence his company's name ModWright Instruments Inc. Under this banner, he has manufactured his own designs of either solid state or tube based preamps and solid state amplifiers. There is a large and loyal clientele for his designs because of a combination of excellent service, great pricing, and very high performing pieces in his product line. • Read more reviews in our Amplifier Review section. • Find a pair of Bookshelf Speakers or Floorstanding Speakers for the KWI 200 to drive. 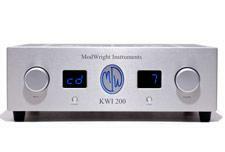 This review is on his new KWI 200 Integrated Power Amplifier, which retails for $5,000.00. The dimensions of KWI 200 is six inches tall by 17 inches wide and deep. The KWI 200 weighs 62 pounds. My review sample was silver, but it can be ordered in black. The KWI 200 is an A/B mosfet based design that puts out 200 Watts into 8 Ohms and 400 Watts into 4 Ohms and has the watts and current to drive virtually any speaker. The front panel of the KWI 200 has two knobs for selecting source and volume, two digital read outs for source and volume level. It also has an on/off button for home theater bypass. Right in the middle of the front panel is an attractive blue back light etched with the ModWright logo. The rear panel has the ICE connector, binding posts for connection to the speakers, three sets of RCA inputs, one set of XLR inputs and finally one set of RCA inputs for home theater bypass. The KWI 200 is a fully functional, easy and convenient to use remote control design. The level of performance and aesthetic appearance of the KWI 200 are of high quality. During the auditioning period that I had the KWI 200, I also had a wonderful selection of speakers in house such as the Aerial Acoustics 5Bi, Vaughn Speakers' floorstanding Barbera, the two-way stand mount Pinot, Reference 3A MM deCapo-I and finally my own pair of MG-1.6's to see how this integrated amp would drive very diverse types of speakers. The conclusions regarding the sonic performance of the KWI 200 were consistent. Even though these speakers used different types of drivers and designs to produce music, the KWI 200 was able to drive anything with a sonic perspective that always stayed musical and engaging. When I put on Dizzy Gillespie's version of "Con Alma" from his album "Bird Songs" (Telarc Jazz CD), the timbres of his trumpet were rendered in a totally natural and believable fashion by the KWI 200. This represents one of the great traits of the KWI 200---a grainless, almost tube-like tonality with great image density. The next enjoyable musical selection using the KWI 200 was Quachi Quaro (Soul Sauce) from the album "Jam Miami - A celebration of Latin Jazz" (Concord Records) which has some of the highest regarded Latin Jazz players to play in a large ensemble. Because the KWI 200 has such a low noise floor, the micro-details and top end extension of the timbales, drums, congas, and Latin percussion just floated in a large, fully developed and precisely layered soundstage. The KWI 200 also produced a powerful and tuneful bottom end that drove this music the way the players would want you to experience it. I wanted to see how the KWI 200 would do with vocals. My next selection was Jacintha's version of the great Johnny Mercer song "And the Angels Sing" from the album "Autumn Leaves" on (Groove Note). 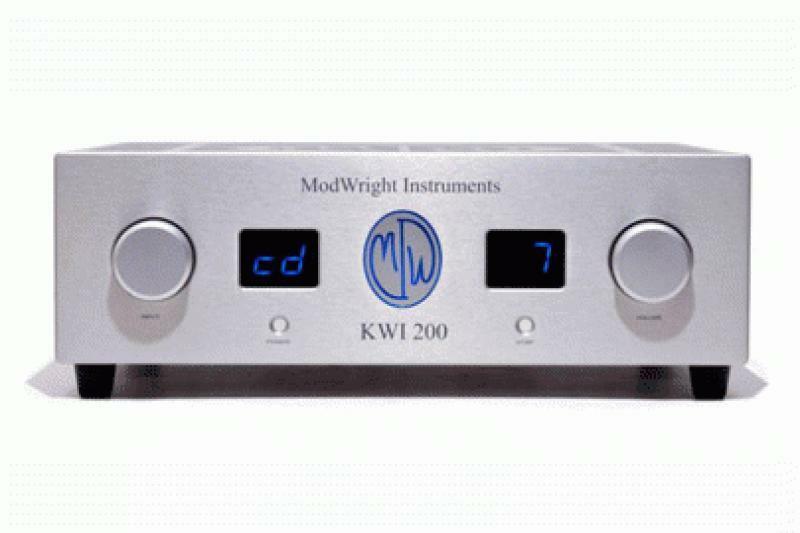 If I did not know that the KWI 200 was a solid state design, I would have been fooled into believing that I was listening to a superlative tube based amp. The texture and emotional content of Jacintha's voice were easily experienced along with a three-dimensional image of her singing with her band mates surrounding her in the recording studio. Read about the high points and low points of the KWI 200 on Page 2.